Gram negative folliculitis is an inflammation of follicles caused by a bacterial infection that can result from long-term antibiotic treatment. Patients who are being treated with antibiotics for severe acne may develop Gram negative folliculitis. The word “Gram” refers to a blue stain used in laboratories to detect microscopic organisms. Certain bacteria do not stain blue and are called “Gram negative. 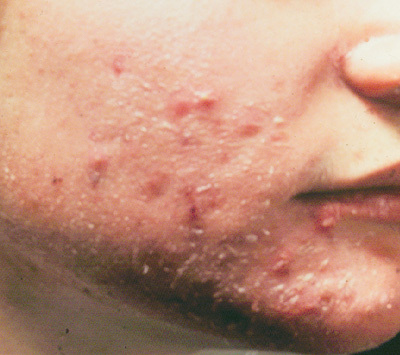 Gram-negative folliculitis is an acne condition caused by Gram-negative organisms. Usually people who had Gram-negative folliculitis are they who had complication with acne vulgaris and rosacea, also develops in patients who have received systemic antibiotics for prolonged periods. H Pylori, a gram negative bacteria, has been implicated in many rosacea research papers as being a factor in rosacea. This controversy continues to be debated.